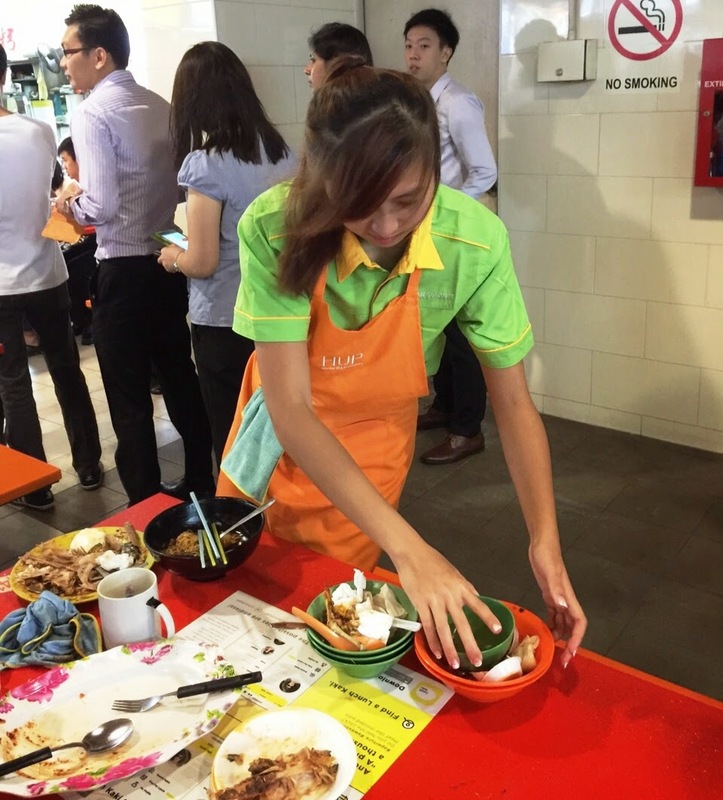 Read on for my experience of being a cleaner at Golden Shoe Hawker Center! 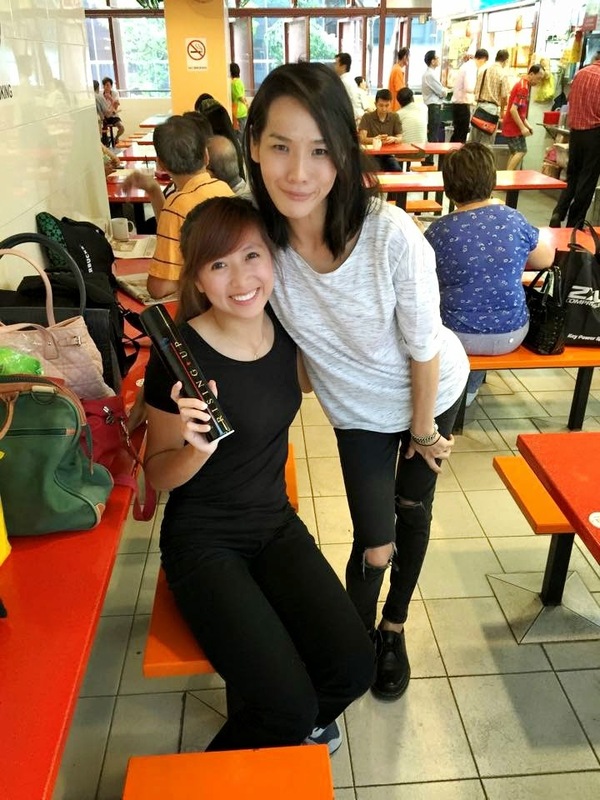 Shot by the Influencer TV, I got to experience firsthand, how to clean up tables in a hawker center! Firstly, I would like to thank Wendy (alongside the Influencer Network production team Dennis, William, and Gerald), for being patient with me and teaching me how to go about hosting this video! At first it was really tough for me to throw away my nervousness because it was my first time filming something like that; but luckily with Wendy's help I managed to appear not-so-flat in the video! Phewwww. 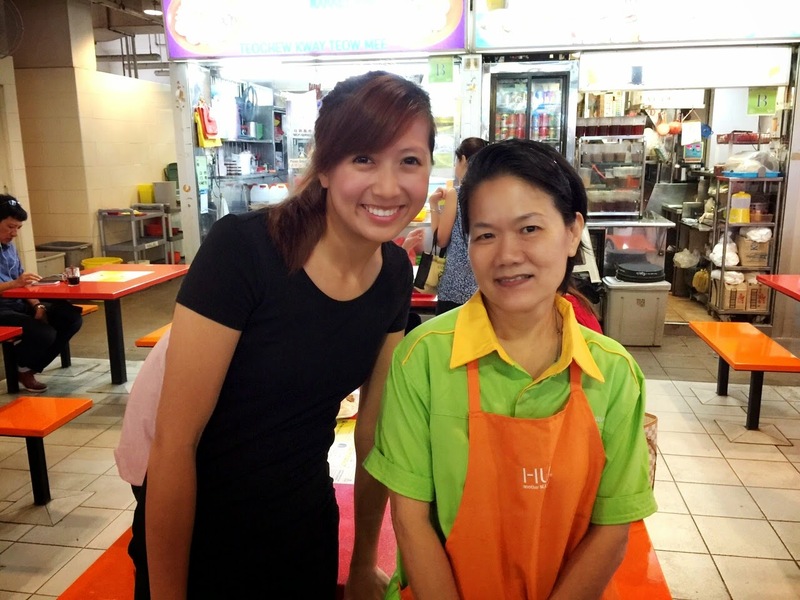 Thank you to the cleaner Mdm Song as well, who showed me the ropes of cleaning up hawker center tables! Here's me cleaning up a particular messy table. This actually took me quite some time because I really did not know where to start. More often than not, we do not spare a thought for the cleaners and just leave our dirty leftovers on the table for them to clean up. The leftovers include fish bones, chicken bones and prawn shells which were scattered ALL OVER the table. It was so gross and disgusting; and I also had to use my bare hands to pick them up and put them into bowls to clear and clean the table. 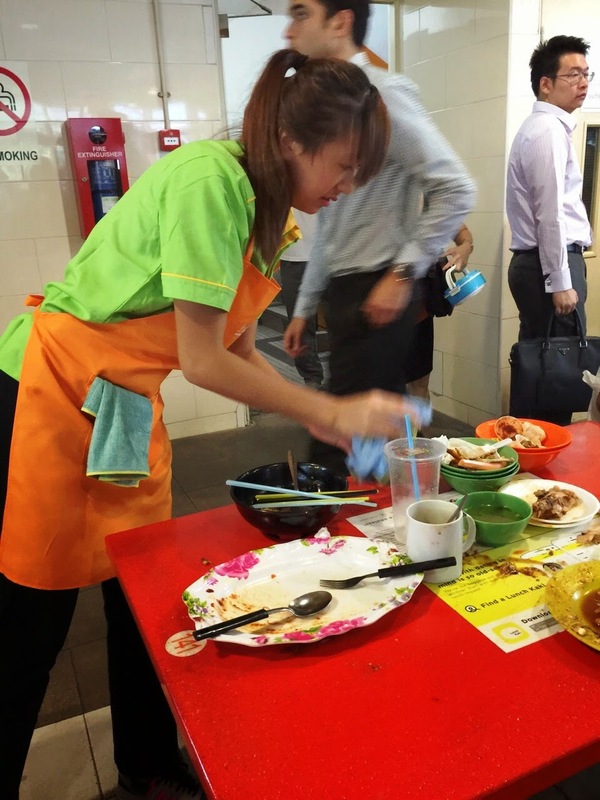 After cleaning the tables myself, I've realized that the job of these hawker center cleaners are really not easy. 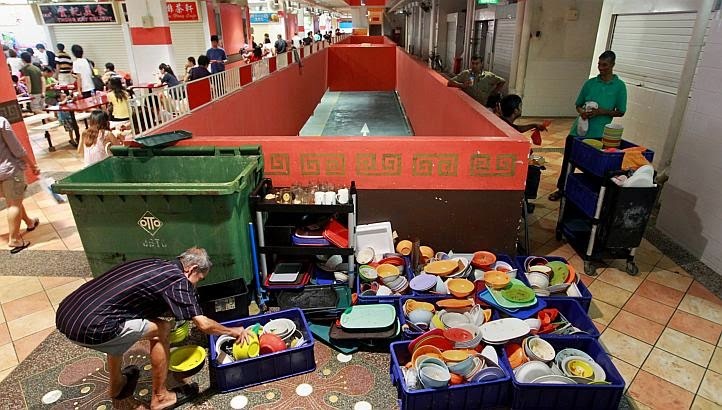 The least we can do is to show appreciation and gratitude to them, our fellow Singaporeans, who help us clean up the tables for the next customers, which could well be us ourselves. DO YOU KNOW THAT THE NUMBER OF CLEANERS WE HAVE IN SINGAPORE IS THE SIZE OF TWO SINGAPORE ARMIES?!! We should be ashamed of ourselves if we belittle the job of cleaners. It is back-breaking hard work for way too little money, if you ask me. If anything, we should be paying the cleaners better for putting up with the mess we create. I read this very interesting news article that said that Taipei, with a few million people, has 5,000 cleaners. 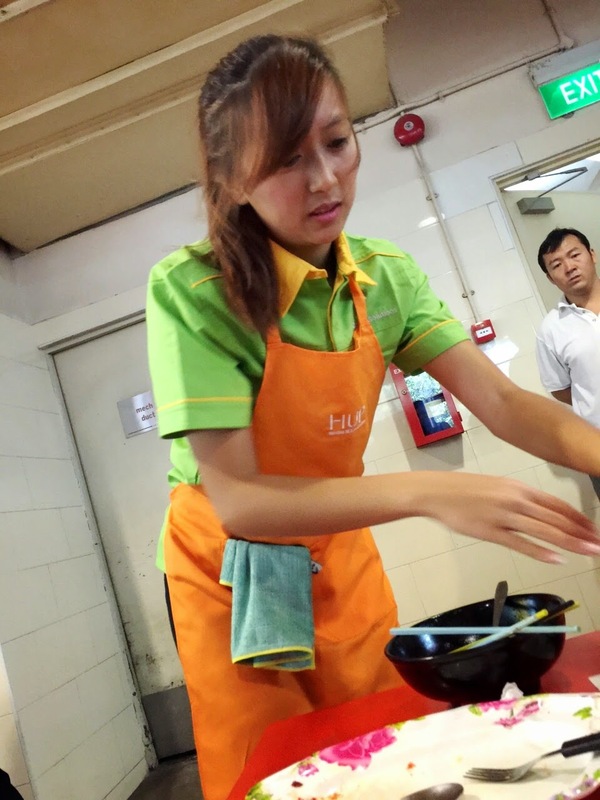 Do you know how many cleaners we have in Singapore? We have five million people and get this, 70.000(!!!) cleaners. That’s equivalent to the size of TWO Singapore armies. The contrast between the two cities is so so so ridiculous I haven’t yet been able to wrap my head around this. So here begets an important question, as important as the chicken and egg question. Is Singapore a clean or cleaned city? Sometime ago, there was an article that went viral online. The article went like If you don't study hard, you will be cutting grass like this man here. Maybe it was this accompanying photo that caused the high shareability of the article. But this pretty writer really does have a very valid and important message to put across to us: every job is respectful and precious. Anyway, I say blue-collared jobs are tough jobs, and these workers deserve every respect from every single one of us. I really like how TIN writer, Jackie Loh has put this across in this article. “What if, one day, every single doctor in the world went on a mass strike. They refuse to work. What will happen? Millions of people will die within that same day. There will be no one to turn to for a cure, no doctor to be there for surgeries, no one to prescribe urgent medicine. Now, tell me that a cleaner’s job is not important. 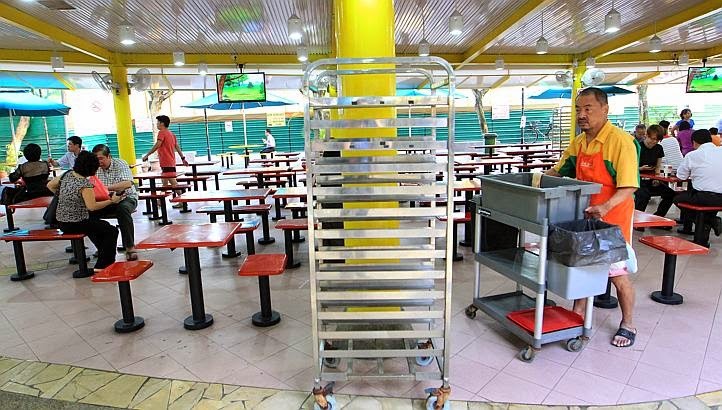 While NTUC has successfully pushed for the implementation of Progressive Wage Model (PWM) for the cleaning sector from last September, more needs to be done. I’ve been following the SgBudget 2015 a little, and am happy to see that the Labour Movement is pushing for more to be done for the low wage workers in Singapore. - A personal SkillsFuture account will be set up, with $500 to be topped up to go for courses to help her upgrade her skills or learn new things. - More support at retirement age with the increase in CPF contribution from employers, and also the additional 1% interest on Madam Soong’s first $30,000 of CPF balances. Read more about Budget 2015 HERE. 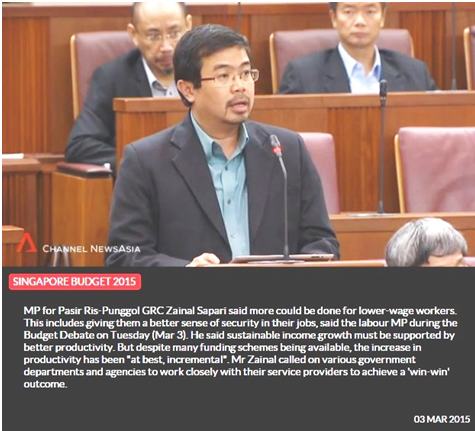 Mr Zainal Sapari, the MP for Pasir-Ris-Punggol GRC, is also one of the Labour MPs from NTUC who speaks up for workers’ rights. I thought his budget speech was very powerful; he said more could be done for the low wage workers, including giving them a stronger sense of security. Many cleaning jobs are outsourced by the service buyers. Mr Zainal advocates that the government can lead by example. The best option is to hire the cleaners directly. But that’s not always possible. Then Mr Zainal wants the government to always be mindful to best-source, and not cheap-source. Don’t always go for the cheapest. Instead, give more weightage to service providers that provide good and fair employment benefits to the cleaners. While striving for value for money and cost savings during procurement are important, it cannot be at the workers’ expense. Really, why must the cleaners always be the ones to bear the brunt of cheap-sourcing? Mr Zainal also brought up the possibility of exploring industry-wide collective agreements as a means to level up the industry as a whole. Basically, the government can legislate such that the industry stakeholders, including the government if they are the service buyers, must agree to certain standards. These standards could include employee benefits that are over and above what is stipulated in the Employment Act. WHAT ABOUT US? WHAT CAN WE DO? While the MPs and ministers are working out how best to do more for the low wage workers, we too can do our part by not messing up our tables, by helping to return trays and yes, by being kind and saying our Thank You to the cleaners we come across on an everyday basis. So here's the final video after hours of hardwork, enjoy! I've also met up with Benjamin, the editor for Five Stars and A Moon, for a short interview! Read about my views on cleaners HERE. After Hours Cleaning Canberra Fixed Price Cleaning is Canberra’s easiest and highest quality cleaning service. Our streamlined cleaning service allows customers to confidently book in End of Lease cleaning and carpet cleaning online and at a time that suits. We are transparent in our pricing, meaning no unexpected costs and achieve the highest quality result by using the best machines, processes and by focusing on the tiniest details. Really nice and informative article it is.I truly appreciate it.It's quite helpful. Hi I was checking for steam boat places & chance upon your blog. What a great post!!!!! And what you did was awesome. I seriously didn't know we have that many cleaners here. We should really try to return our trays if possible to make things easier for the cleaners. This is great article and so helpful. Services Company in Singapore? Visit here for more information at cleanandcare.com.sg." Very interesting and insight info. Last month I have hired services Mattress Cleaning Adelaide that was amazing and affordable price. I suggest to all guys, before hiring services must get free quote and check portfolio. I really appreciate your work. This post is really handy and useful, I am sure people will get help from this. And thanks for sharing. BlueHost is ultimately one of the best hosting company with plans for any hosting requirements. Everyone desires to live in a perfect home but not everyone has all the time in the world to clean his or her home. Without proper house cleaning, the house becomes very shabby, dirty and untidy. Of course, you can clean your house all by yourself but the easiest way to get a perfectly cleaned home is to hire house cleaning services in Minnetonka, MN. This post really very helpful. I am appertained for your work. To maintain the perfect cleaning services in Singapore. This is very nice and informative blog , thank you for sharing such like of information .. I came to your website for the first time I like your website very much And your website article is very much. 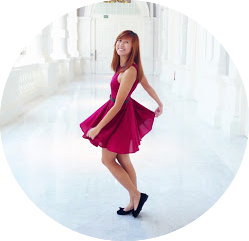 I have a IVC – Services – india visa singapore website. I'm an outgoing girl who's very expressive and enthusiastic! I'm also a real estate salesperson. More about me HERE. For adverts/sponsorships/collaborations enquiries, contact me at chengkaiting@gmail.com! Check out our property Instagram account HERE and our Facebook page HERE. For real estate enquiries, contact me at kaitingcheng@propnex.com!